1.Please hook up the device to the direct USB port on your PC. 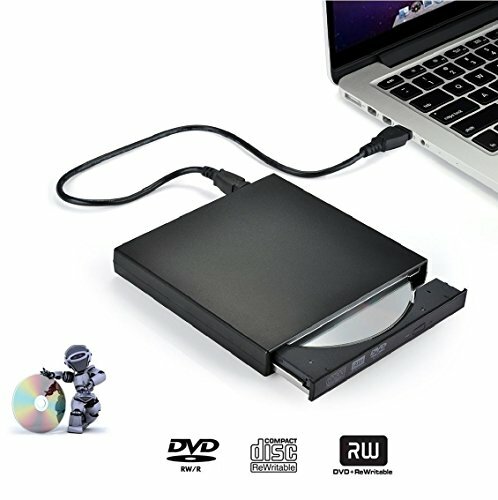 If you connect it to a USB hub or extension cords, it may can't recognize the Driver or read the CD/DVD. 2.For the desktops, please connect the device to the USB port of the motherboard for normal use.Using USB 2.0 DATA Cable and Power Cable together if your device cannot recognize the hardware because of the insufficient power supply. 3.Internal laser light can be harmful to the eyes, face, please don't open. 4.Do not keep the machine in a nearby strong magnetic objects. [Compact Design] It is portable for travel with your laptop thanks to its small size. It will be specially handy for your work if you want to give presentations to the business. Just burn the DVD to suffice everything and do not need to carry laptops everywhere. [USB 2.0 Interface] USB 2.0 is backwards compatible with USB 1.0, Efficiency more stable, Applies more widely. Come with 2 cables, one is data cable and the other is power cable that can supply power to get rid of the trouble of shortage power. [Universal Compatibility] Works great with Windows XP/2003/Win10/8.1/8/Vista/7, Linux, Mac 10 OS.For Netbooks, Surface, Notebooks, Laptops, Pads, Apple, Desktops etc..